Jasmina Shube of Marblehead loves getting books and anything to do with horseback riding. NOVEMBER 29, 2018 – Everyone knows there are eight nights of Hanukkah. But for young children and their parents, that means eight nights of gifts. “It’s hard trying to redirect a 5-year-old to understand why we’re here, why the family’s getting together, what we’re doing, because I do feel like young kids just care about the presents, and that’s fine,” said Jen Swafford of Swampscott, whose son Nathan is eagerly awaiting eight nights of Legos, video games, and more. “That’s just young kids being young kids. But I think it’s important to let them know why families are getting together, and why we have these traditions. “We light the menorah, and read Hanukkah stories so he understands the Jewish faith. We try to keep it simple and family-oriented,” said Swafford. For centuries, Jews have observed Hanukkah, which celebrates the Maccabees’ revolt against the Seleucid Empire that led to rededicating the temple on the Temple Mount in about 165 BCE. But it was not until the 20th century in America that the holiday became commonly associated with gift-giving. According to Jonathan Sarna, a professor of American Jewish history at Brandeis University, gift-giving did not occur until Christmas became a national holiday in the United States in 1870. 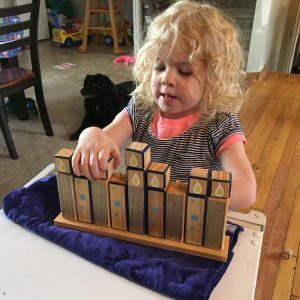 Because Hanukkah fell during the same time of year, Jewish parents – especially after World War II – began giving their children eight nights worth of gifts so that they would not feel like they were missing out. 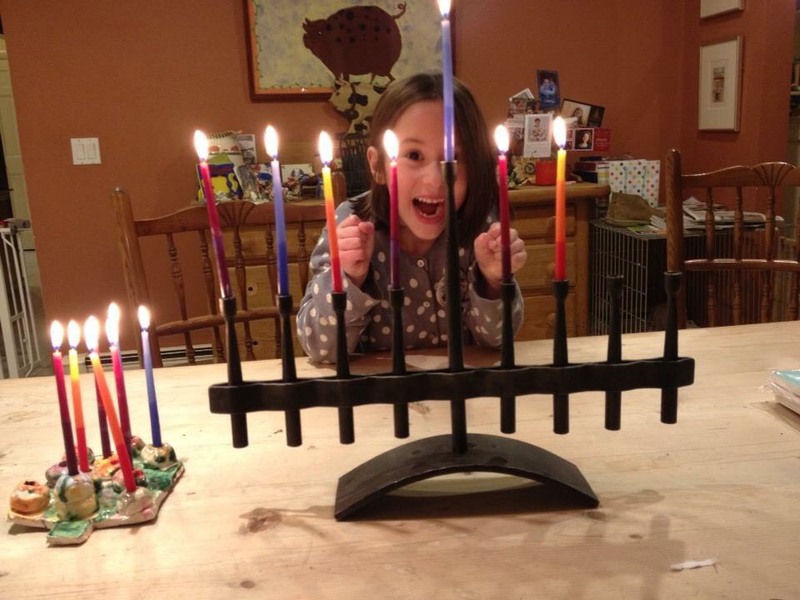 Ruthie Stephens of Swampscott builds her own menorah. Sidman said sometimes her children forget the newest electronic fad after a little while, while staying attached to simpler gifts. Some parents give their children experiences instead of material gifts. Shube and her daughter often go to the Boston Symphony Orchestra to watch movies accompanied by a live orchestra. Sidman takes her children to a fancy hotel in Boston for one night. However, parents agreed that it is essential to remind their children that not everyone is fortunate enough to get gifts for eight nights. Sidman and her family buy gifts for children in need through an adopt-a-family program.